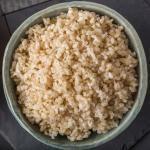 If you think boiled brown rice is as easy to make as white rice, then you are mistaken. Check out this perfectly cooked brown rice recipe to make yours perfect next time. Rinse rice in a strainer under cold running water for few seconds, swirling the rice around with your hand. Bring water to a boil in a large pot over high heat. When water boils, add the rice. Turn heat to medium and boil, uncovered, for about 30 minutes, stirring occasionally. After 30 minutes, pour the rice into a strainer over the sink. Let the rice drain for couple of seconds, then return it to the pot, off the heat. Immediately cover the pot with a tight-fitting lid and set it aside to allow the rice to steam for 10 minutes. Make sure that the pot lid is extremely tight and pot is tightly sealed. After ten minutes, uncover rice, fluff with spoon or fork, and season with salt to taste.